Retreats are a great way for you to be away from your daily schedule without having to worry much about planning and going all crazy about coming up with your vacation activities. There are many reasons why people go on retreats and we would like to share a couple of benefits to going on retreats. 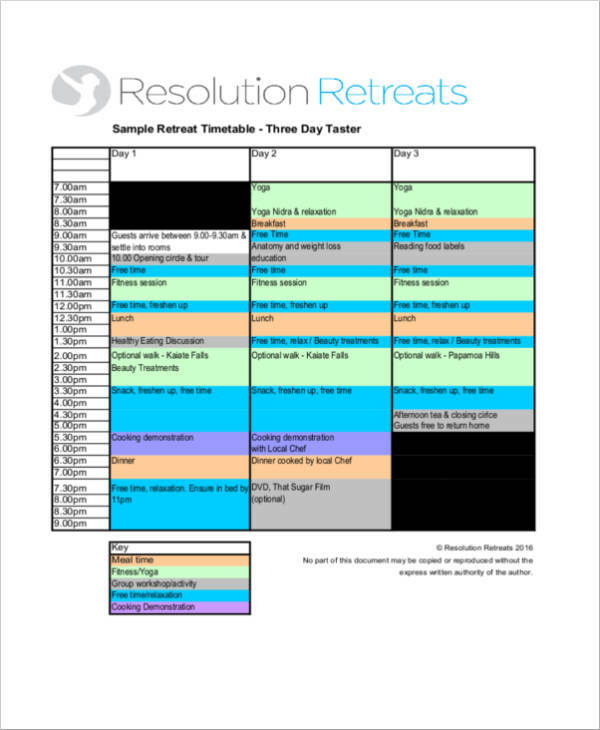 If you also want to know how typical retreat schedule samples look like, you may take a look at the samples that we have inserted in this article for your reference. 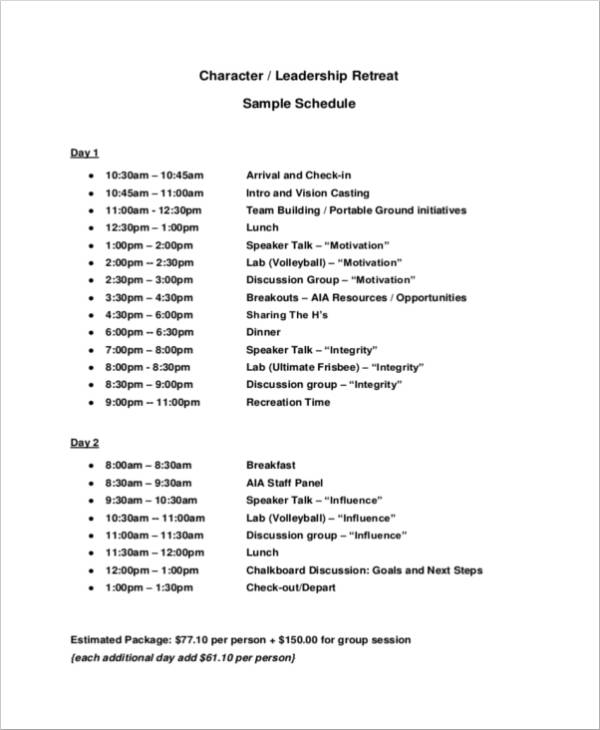 This will give you a good idea regarding how your retreat may go. 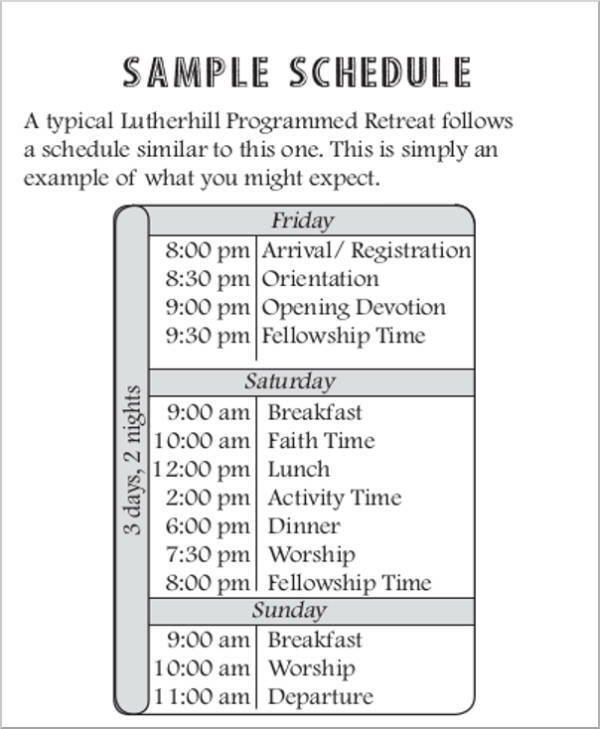 You can also try to make your own schedule and suggest it to your retreat host. What a retreat basically means is to withdraw yourself from your day-to-day activities. It can either be through prayer, reflection, or meditation in order to reconnect yourself with nature. Retreats are typically conducted in retreat houses or venues wherein people do not have access to the Internet or do not have any means of virtual and electronic communication with those who are not involved with the retreat. 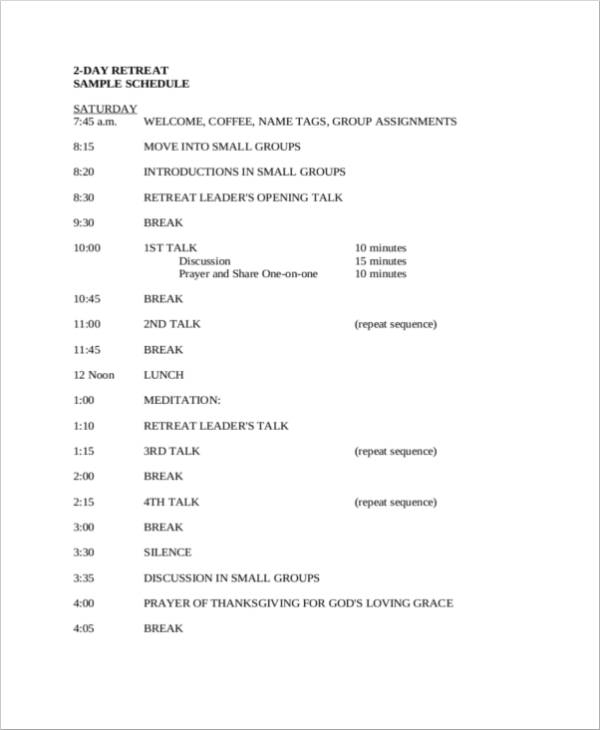 Check out some of the free schedule samples that we have available. Why Should You Consider Going on a Retreat? People all over the world go on vacations in order to unwind and reward themselves. They would like to take a rest and rejuvenate, which makes them feel more refreshed before they go back to work or do their usual daily planner routine. Planning and coming up with the perfect holiday can be quite a task! You will typically find yourself constantly checking airline websites looking for the best flight deals. Plus, you will also find that you would need to come up with a travel agenda in order to make things more orderly. This just defeats the purpose of wanting to go on a holiday sometimes, which is to basically relax and recharge. This is where a retreat enters the picture. There are a ton of retreat houses that offer retreat packages that can help to make the planning task a little bit easier. Many retreats offer many benefits from spiritual healing, to fitness, to counseling, and a whole lot more. There are many reasons why people go on retreats. Here are a couple of reasons why you should consider going on a retreat instead of going on a regular vacation schedule. Vacations offer you an escape from your typical routine. Guess what? Retreats aim to do the same as well. However, retreats are more specific in terms of the of the intent. The specific intent can be an issue that you and the other members would like to address or maybe you would like to reconnect with the other members again. Your intent may also be wanting to be more aware of your surroundings and be more connected with Mother Nature. Another good example of an intent can be wanting to be one with nature and be more connected and aware of your surroundings. 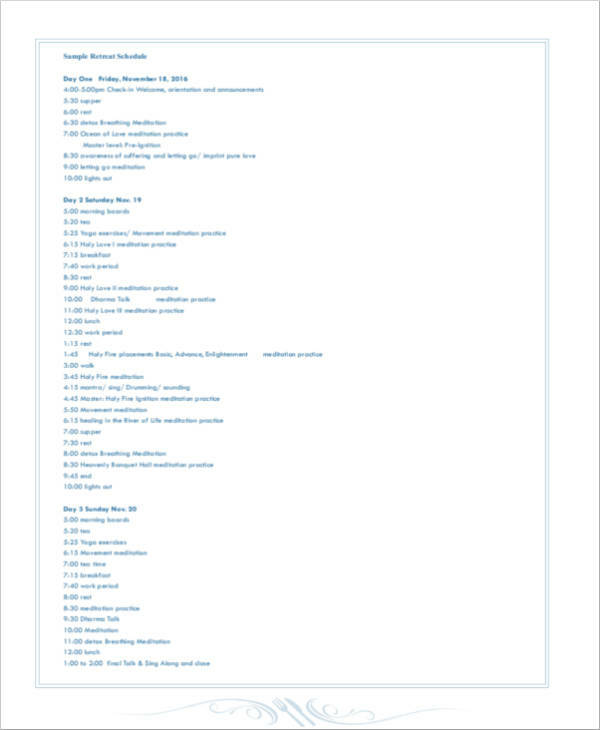 You might also be interested in travel schedules. In line with the intent that you have, the location, accommodations, facilities, consultation schedules, recreational activities, and other relevant activities are just as important. These factors help to make your retreat experience more complete, more impactful, and more memorable as well. Compared to vacations, you are highly likely to gossip and not be able to concentrate on your intent. Make use of activity schedules to help you keep track of things. You also have to take note that a vacation that lasts about 2–3 days will only bring short-term improvements unlike a week’s worth of contemplating and meditation which can help to improve your overall well-being. 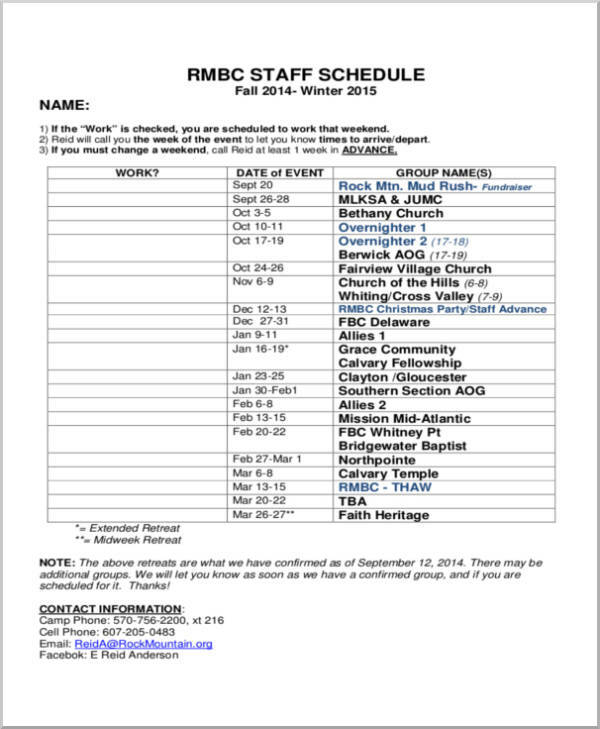 You may also see Work Schedule Templates. For example, when it comes to yoga retreats, people who participate in retreats like this can help to relieve respiratory problems, can help to make their bones stronger, can help relieve arthritis and other joint problems, as well as other ailments. If you want to experience solitude and peace, retreats can provide this to you. Retreats can be done individually, with a partner, or in groups. Utilizing a group schedule might benefit you. Retreats are usually done in places that are secluded in order to separate the participants from the real world, from electronics, and from the hustle and bustle of the city. This helps the muscles and nerves to relax, which ensure that people are able to focus more on reconnecting with their family, partner, or self. This is the opposite of a typical vacation where you might be exposed to busy streets and a lot of noise. While vacations do provide activities for you to do while you are in the location, retreats can also offer a wide range of activities that can help you achieve the intent that you want. You may also see Rotation Schedule Templates. One of the biggest advantages of going on a retreat? It is being able to be connected with nature and be healed because of nature. This cannot simply be matched by a vacation. Retreats can help you become closer to nature and help you to lessen the stress that you are feeling. Plus, exposure to nature can be beneficial due to the fresh air, calm environment, and the presence of plants can help you feel rejuvenated and can make you feel rejuvenated, which gives the feeling of a fresh start. 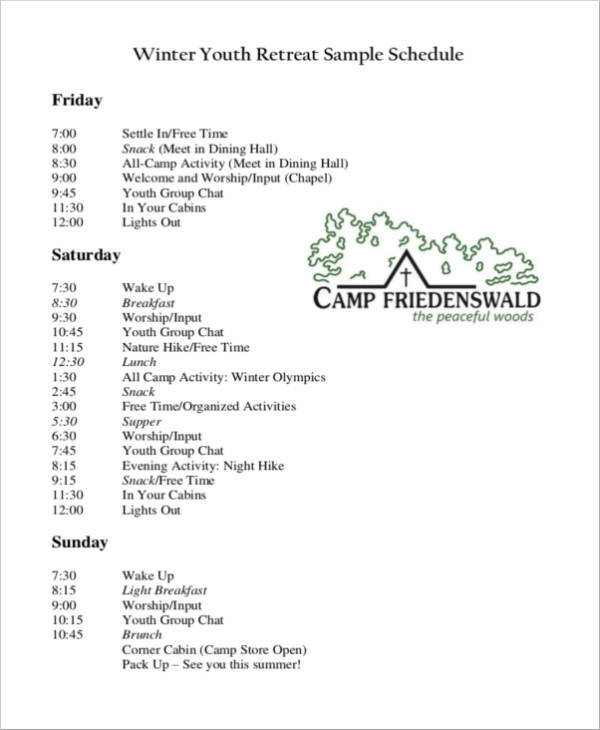 You may also see holiday schedule. People who participate in retreats are likely to have the same interests and/or concerns. Being around people who have the same intentions as you can help you discuss in a healthy manner and also help you achieve your goals faster. They will be your support system as you try to rejuvenate and destress. They will also help you pinpoint any of the issues that you might be facing and help you realize that you are not the only one going through what you are going through. Also check out study schedules. You will also be able to pick up new connections and new friends because of retreats. You can exchange numbers and keep in touch as you go your separate ways. This is not as common when it comes to regular vacations. You may also see Vacation Tracking Samples. 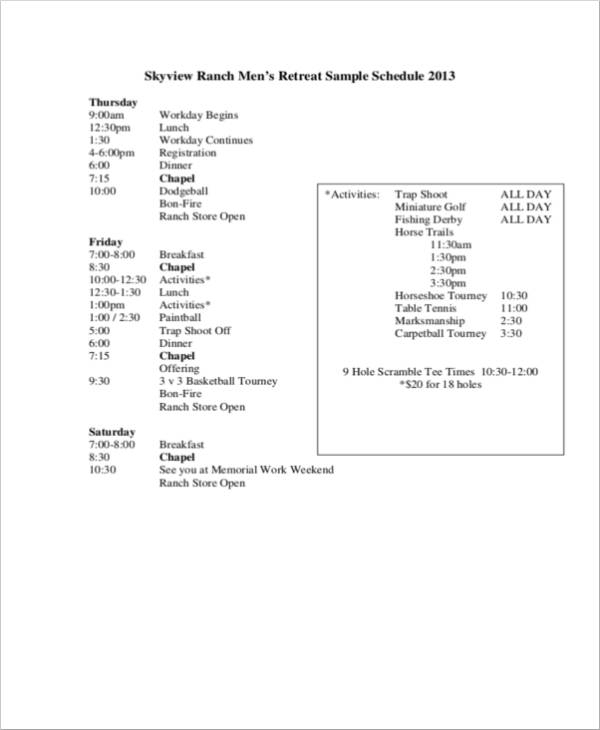 Some of the activities included in retreats are training schedule, exercises, and/or counseling sessions. To ensure proper guidance, professionals are usually hired to do this to ensure that the spiritual, mental, and physical well-being of the individual is addressed properly. This will help to ensure that you are going to get the help and advice that you need that you will continue to appreciate even if the retreat is over. 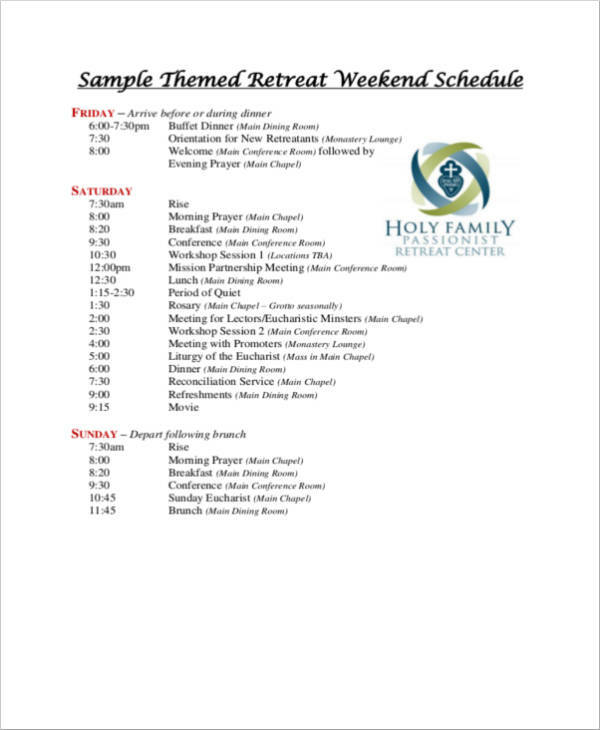 When it comes to retreats, you do not need to worry much about planning and schedules as the retreat house will already provide the services that you will need to unwind and relax. Transfers, commutes, locations, and reservations are all provided. This is a good break from typical vacations where you are the one who needs to make the agenda. When it comes to retreats, all you need to do is to just show up to the meetup point or the retreat location, and the retreat house will do the rest for you. So just chill and enjoy this stress-free version of your life. 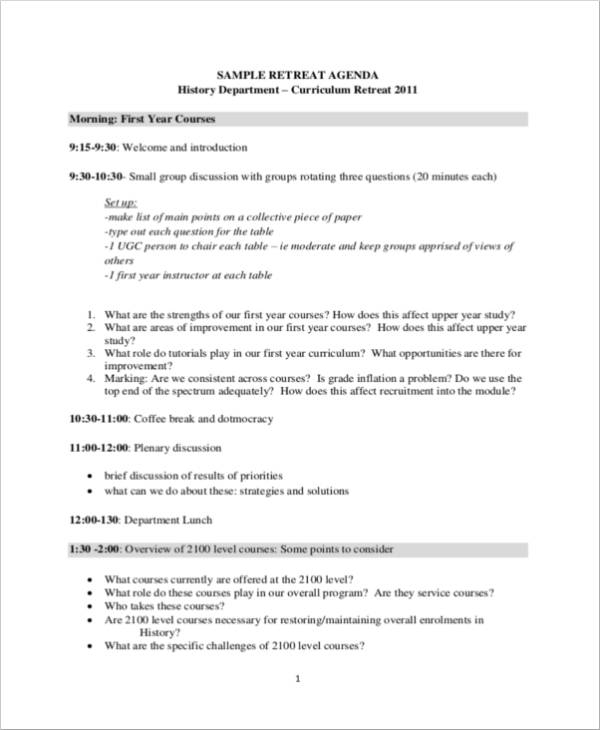 You may also see Meeting Schedule Samples. Retreats can be more economical and cost-effective compared to a regular vacation. This reason for this is because a ton of times, your spending is based on your own decisions, which can cause overspending or overbudgeting. 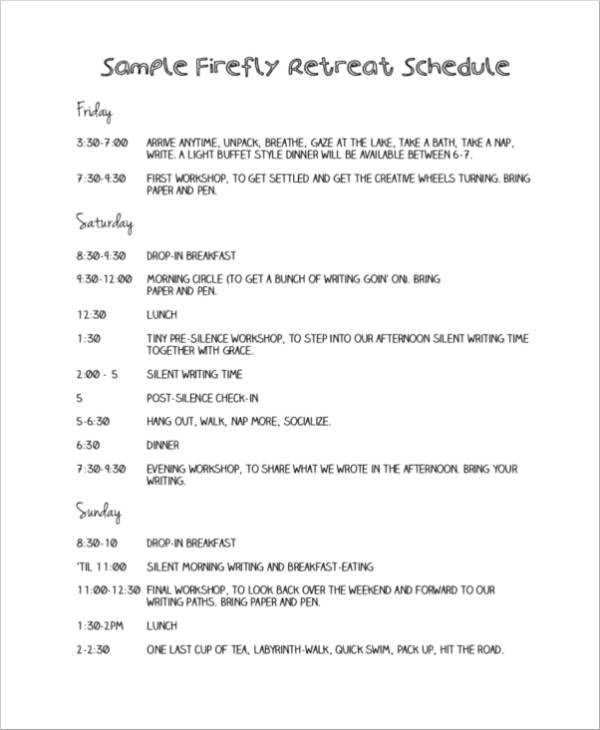 With retreat schedule template, everything is planned ahead of time and there is no need for you to worry about spending anything as the retreat house will take care of everything for you. Thus, this makes everything a whole lot more reliable financially. However, this does not mean that retreats do not tend to be expensive as there are times that they actually are expensive. But if you want assurance when it comes to how your money will be used, you can opt to try going to a retreat every once in a while as opposed to vacations where you are the one who will make all of your budget plans. Now that you have a good idea about why a lot of people opt for retreats, maybe you would like to try going on a retreat the next time you want to go on a vacation. So, for your next holiday, go on a retreat agenda that will be a good fit for you, your partner, your family, or your friends. 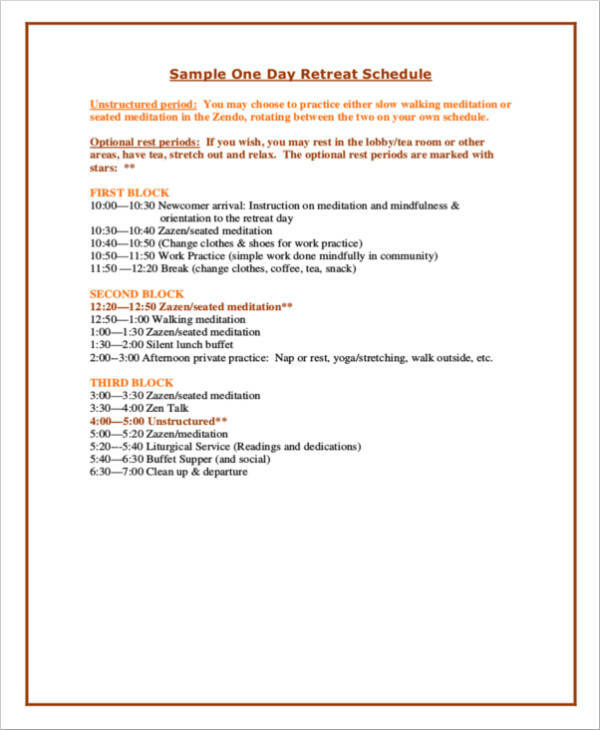 We hope you like this article and we hope that you find the sample schedules useful when you start coming up with your own retreat schedule.